Welcome to Ken Schall Golf Performance Studio! Jon Cornish, Ken & Connie Schall – holding Sadie. In March of 2015, we realized our dream of creating a state-of-the-art teaching/clubfitting studio that can help golfers improve their games. I have had a profound passion for teaching the game for over 30 years. The main teaching/club fitting room is powered by Trackman. Trackman software is used by most PGA Tour players to collect accurate data for their swings and equipment. Think of Trackman as an MRI for your swing and equipment. 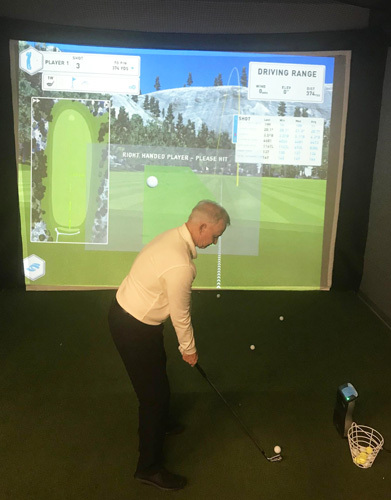 Students will be able to see their swings and swing data during the lessons and will be able to access their swings, instructor notes and training drills via smartphone or PC after the lesson is completed. I am a PGA professional who coaches all parts of the game, not just swing mechanics, but scoring, mental preparation and course management. Above all, I try to communicate to students in a simple manner that they can understand and apply. In 2017, and again in 2018, I received the Iowa PGA Teacher of the Year award. Our studio is also a full-service club fitting and club repair operation. 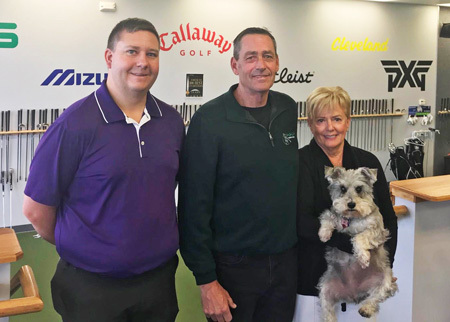 In 2019 as in 2017, we were recognized by Golf Digest Magazine as one of the Top 100 Clubfitters in the United States. We have fitting equipment from all the major manufacturers including Callaway, Cleveland, Epon, Mizuno, PXG, Ping, Titleist, Taylor Made and US Kids. There are literally thousands of shaft/head combinations available in our studio. We stock premium shaft offerings that you will not find anywhere else in the state of Iowa. Our practice and simulation bays feature Foresight Quad Simulation Units. Players can have practice sessions and receive accurate data from their shots. Golfers can also bring their friends and choose from several courses to play when the Foresight units are switched into golf course mode. This area of the studio works well for hosting birthday parties, golf team gatherings, even small corporate events or board retreats. Patrons are welcome to cater in food and beverages for small gatherings like this. Our full-service club repair and adjustment room is managed by Jon Cornish, certified by GolfWorks, True Temper and KBS. We feature Mitchell club repair equipment, regarded as the best in the industry. We can do any and all repairs and offer a full range of grips and shafts. Our studio also specializes in corporate golf ball and apparel. 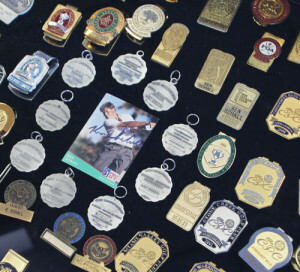 If your company is in need of logoed apparel or golf balls, we can provide it from a number of different companies. Stop by, check us out – and start perfecting your game!